Climate change is the alteration of global weather patterns, leading to an increase in sea and land temperatures. Global warming is due to the loss of natural temperature regulators of the planet such as ice sheets reflecting hot sun back into the atmosphere and less forests to filter the air. These factors result in the increase in the presence of greenhouse gases. This irregularity in temperatures causes irreversible damage upon almost all aspects of the natural world thus altering population numbers of many species of animal and plant. El Niño is a natural climate phenomenon which occurs approximately every seven years involving the cycle of warm and cold temperatures. The Galapagos Islands are situated in the confluence of major ocean currents – the cool Humboldt Current from the south, the warm Panama current from the north and the cold upwelling Cromwell current, which surfaces to the west of the Archipelago. They are also home to a large number of endemic marine species. This change in ocean temperature, although only slight, can have devastating effects on the wildlife populations in Galapagos. El Niño affects the marine life of Galapagos in a powerful way, as it changes population numbers of almost all species in Galapagos in a short space of time. The slowing of the Humboldt current means the sea temperatures rise, reducing the growth rate and the abundance of algae and seaweed, the staple food source for many sea creatures, particularly the marine iguanas. While some species are able to migrate away from the Islands to find food, others cannot. Species like the flightless cormorant and the Galapagos penguin struggle to find food. Not only are they threatened by starvation, but they also stop reproducing. Climate change also has a strong effect on land-based creatures. As rainfall increases dramatically during an El Niño year, tortoise eggs in nests can be washed away leaving fewer hatchlings. Whilst this increase in rainfall is beneficial to the plant life of Galapagos, some species end up waterlogged with collapsing cactus common during an El Niño year. The warm and wet conditions also provide the ideal conditions for many invasive species to thrive, such as the parasitic fly, Philornis downsi. 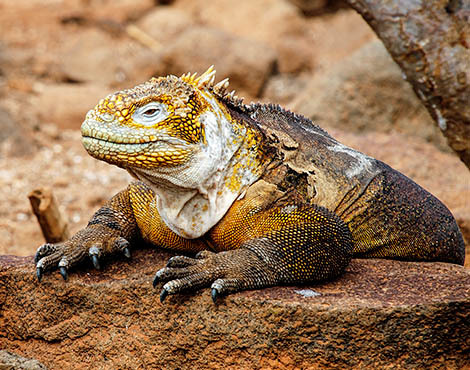 The monitoring of climate change within Galapagos is extensive, with teams of scientists and researchers from all over the globe measuring and tracking weather patterns and animal behaviour. Improving our understanding on the true impacts of both long term climate change, and short term changes from El Niño events on these vulnerable species and their ecosystems is critical for informing future conservation management. Looking to the future, continued climate change is predicted to affect El Niños frequency and strength, meaning that this could contribute towards the extinction of several species. Our ability to track and monitor these effects is paramount.